Loosies is Fool’s Gold’s first rap compilation: 22 high-grade, mentholated cuts from the label roster and extended family, curated by FG founders A-Trak and Nick Catchdubs. “One of the things I’m most fond of with Fool’s Gold is our extended family,” says A-Trak. “Our foundation is in hip hop and the talent around us is incredible. 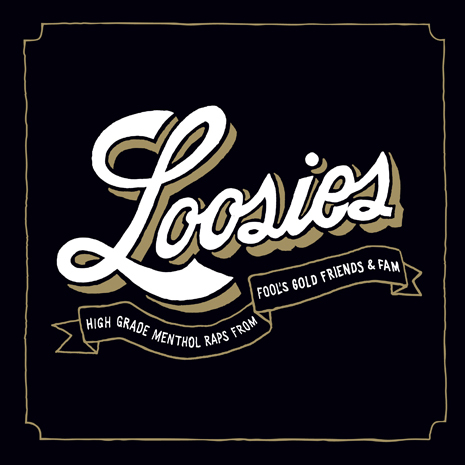 Loosies is raw, unadulterated rap from the dudes who hang out with us backstage at Day Off.” From new school kings (Danny Brown, Action Bronson, Flatbush Zombies, Freddie Gibbs, AraabMuzik) to unexpected vets (El-P, Freeway, Jim Jones) and brand new discoveries, Loosies stays smoking. Get it on all digital services, as well as compact disc and a limited edition, cigarette-shaped USB with collector’s box. Sleeve by Dust La Rock.